The theme of the month of April was patience – which is a pretty lousy theme if you ask me. Lots of little things have been happening, so I thought I’d share them all in short form rather than spend too much time on any single thing. And who doesn’t love bullet points? Leslie and I just had an update with our builder – and it looks like late June is the new target for our closing. Our original date was late March. Oy! But our drywall is hung and they’re working on cabinets this week. Lucy and Mabel are growing in personality with each day. Lucy can almost write her name (with some help) and remembers things that we said in passing days before. Mabel walks very well now. One of her favorite things to do is to grab and pull on Lucy’s hair. She makes a happy growl kind of sound while doing it – very cute. We have been spending time in our new neighborhood and have met a few neighbors now. Praise God for some friendly people! We just met a couple across the street, and we’ve connected for the second or third time now with another couple the next street over. Just can’t wait to actually live there. Leslie and I have been working really hard on diet and exercise. This new push came out of some stuff I’ve been working on having to do with discipline. I’ll try to write a longer post about this in the near term, but I’m sure you’re aware of the powerful links between spiritual, mental, physical, and relational health. I’ve been having a really productive time working with my church planting coach/sponsor, Terry. Terry and I are connecting well on a lot of the ups and downs of trying to live life on mission, and I’m really thankful for the mix of accountability and unconditional support I’m getting from him. I saved the best for last. On April 29, my sister, Katie, gave birth to her first child, William Lee Tanenbaum. One of the recommendations that Leslie and I received at the end of our Assessment for church planting was to take some kind of grace seminar. Leslie and I are both oldest children, and we have some Pharisaical tendencies. Living according to God’s grace takes work (ironic!). Every person who comes to know Jesus as Lord starts out with many deeply ingrained habits (that all made sense when we didn’t know about God’s love for us). It takes a lifetime to discover all of our old, bad habits, seek healing from God’s Spirit, and then establish new habits built on the foundation of grace. One of the ways God helps us with this challenge is through the gift of community. We’re not supposed to be alone! Leslie found a Christian counselor in Austin who runs a nine month seminar called “Heart Living” that meets at a church in East Austin. The central idea of the course is that we can live from our whole hearts, as a whole person, all the time, but it takes work and God’s grace. What does it mean to have a whole heart? Well, I’m pretty sure we all know what it feels like to feel divided or like a shallow version of ourselves. Sometimes we get blinded by anger or anxiety (or even things like hunger) and – instead of seeing things from an eternal perspective (illuminated by the Holy Spirit) – we retreat, snap at someone, or overindulge in something in search of satisfaction or comfort. To live according to the whole heart is to be aware of your emotions, the needs behind them, and also the bigger picture of God’s grace-filled plan for your life. Leslie and I have gotten a lot out of this course, especially with regards to parenting. Lucy is three now and she has some strong emotions that can elicit some similarly strong ones from us in return. Lucy was recently disobeying our family dinner rules. She was repeatedly leaving her seat, which isn’t a big deal, but it was still pretty irritating for me. I told her that if she left her seat one more time, she would have to go straight to bed. I had a lot of things on my mind at that moment. I wanted Lucy to behave. I wanted to eat my dinner. I knew that her bad behavior was appropriate for her age; she has been testing a lot of boundaries lately (like the “don’t kick dad in the nose” boundary – ouch). I was feeling unsure of my parenting decisions. Was I setting her up for failure by insisting that she eat dinner, when she might have spoiled her dinner earlier with a snack? Was I being frustrated more easily because my own dinner was being interrupted? Our Heart Living class put a lot of emphasis on this kind of emotional awareness. We want to make good decisions that honor our Creator and imitate the love of Christ, but that’s a lot harder than it sounds. God was kind to me this particular dinner, because right after I gave my ultimatum to Lucy, she looked at me and threw her milk cup off the table. No more uncertainty! Lucy cried a lot as I put her to bed. I could tell that she understood that she had disobeyed, and I know that it will be better for her in the long run to have a stable homelife with consistent rules, but it was quite an emotional experience for me, too. Lucy did not try to leave her bed, fell asleep, and gave me a big hug the next morning. One of the perks of receiving support from the WBA is a free Residency with Forge America. Forge is a missionary training program founded by Alan Hirsch and Michael Frost in 1996 in Victoria, Australia, and the residency program is a nine month learning cohort with coaching, training sessions, some reading, and practical exercises. We had our first weekend intensive session this last Friday and Saturday. Leslie and the girls were able to join us for most of the time (which is really fun). I am really happy that Forge exists. I’ve gone to seminary – but the more time I spend thinking and learning about missional community life, the more I see the gaps in the traditional western seminary curriculum. I think Schleiermacher came up with the general outlines: biblical theology, systematic theology, practical theology (preaching/church life stuff), and church history. In this system, missiology fits under systematic theology (and occasionally pops up other areas). Forge flips the order around in a big way. In the “institutional church” paradigm, the church has a mission. In the “missional church” paradigm, God’s mission has a church. That’s all I have to share at the moment. My parents visited the week before and our house is finally under construction! Last week Leslie and I had a wonderful time at ECO’s National Gathering in Newport Beach. We had a lot on our minds going into the trip – an important committee meeting, fundraising hopes and dreams, etc. – but we were also really excited to get to do a trip with just the two of us. Our flights were super easy. When you’re used to taking a toddler and a baby on flights with multiple connections during the holidays, flying as just a pair of adults feels surreal. The weather was beautiful. Leslie found a great AirBnB spot for us within walking distance of the host church. Of course the first flights we do without our dear kiddos are less than half full. The conference was held at St. Andrews Presbyterian Church, and they have a pretty impressive campus. ECO had a really great showing, and their sanctuary fit the crowd very well. Leslie and I were able to meet up right off the bat with our friend Jonathan LaBarge. Jonathan and his wife are pastors at a church outside Los Angeles that is home to an English-speaking congregation, a Spanish-speaking one, and a new church plant. Leslie and I first connected with them a conference at Mt. Hermon in 2013 when Leslie was on maternity leave with a very young Lucy. They are really genuine and friendly, and sometimes I even forget the fact that Jonathan is a lifelong Lakers fan. We also met up with our dear friend Andrew Dickinson. Andrew and his wife Sarah were a part of the church where I did my field education in seminary, and Andrew enrolled at Princeton a year after I did. Andrew and Sarah live with their two daughters in a suburb of Atlanta where Andrew is an associate pastor. Andrew takes lectures very seriously. I’m going on and on about meeting with friends because relationships like these are what the church is all about. Of course there were meetings and votes and things, but time together with other members of Christ’s body is supposed to be fun and encouraging and family. I love spending time with friends like Andrew and Jonathan because we can share about the stuff that is important to us on every level. All too often that’s not the case – and we end up compartmentalizing ourselves (faith, relationships, work, recreation) and life starts feeling scrambled. Leslie and I met with the church planting committee for the presbytery of TX and LA first thing in the morning on the second day of the conference. We talked about next steps and got some encouragement on our proposal and overall vision. There’s still a bit of confusion about which steps are supposed to happen when, but I can tell people are really getting excited about the big picture of missional transformation and church planting strategies. We also met with the presbytery as a whole, and Leslie and I got to introduce ourselves and the outlines of our vision for a new church in Austin. 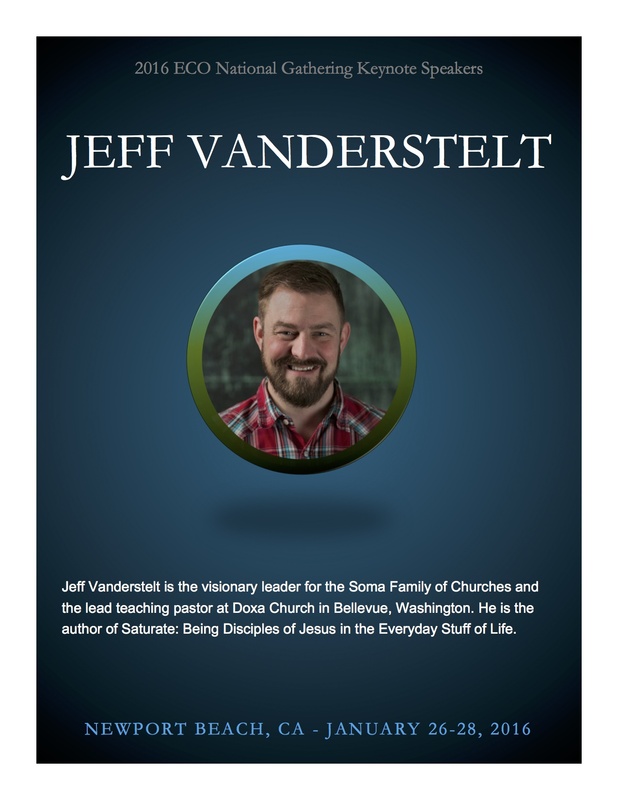 Jeff Vanderstelt gave an amazing keynote presentation. I was very excited about his talk for a lot of reasons, and he did not disappoint! Jeff is the real deal. The way that Soma (the church – the people) has taken up the quest of bringing gospel saturation to Tacoma (and beyond!) gives us a lot of hope as we try to do the same thing in Austin. The way that Jeff talks about discipleship and faith is inspiring because it sounds simple and sustainable. Leslie, Andrew, Jonathan and I also attended a breakout session led by Alex Absalom. Alex was on staff at RiverTree Christian Church in Masillon, OH (a stop on the Future Travelers tour) as a kind of embedded missional theologian. He’s now doing a similar thing in at a church in Long Beach, CA., He also runs a missional consulting group, has his first book coming out really soon, and is super active on Twitter (@alexabsalom). Alex gave a talk about group dynamics and mission that was similar to one of his presentations for Future Travelers (I like to think of it as his mathematical proof for missional communities). After the talk, we stuck around and invited Alex to join us for dinner at a neighborhood bar that Leslie and I had scouted earlier. Talking about church leadership is fun, but talking about church leadership with burgers and beer is much, much more fun. We definitely exceeded our daily steps goals on this trip. Leslie, the girls, and I had a great Christmas and New Year holiday break! We had lots of quality time with family. Leslie’s sister and family and brother came and stayed with us and Granny and GPa (G-Pa?) in Lakeway and we a had a full house. It’s always great to hear how God has been active in our family – a family member had just returned from trip to South Asia where he was doing some neat missional work. It wasn’t “overseas missions” in the typical sense; his group spent most of their time interacting with local church leaders, sharing best practices, encouragement, and Bible studies. They visited both non-Christian and extensively Christian areas (including Nagaland, which I was surprised to learn is more Baptist (75% of the population) than Mississippi (55%)). He shared a lot of stories about church planting and discipleship strategies. It was encouraging to hear about efforts for missional transformation (helping God’s people follow God’s will for their lives) are happening around the world. The day after Christmas we got up and caught a flight to the east coast for round two of family time. We spent a few days in the Kennett Square area and got to see some friends from high school and college. Then we all drove up to the Poconos to my parents’ new house just down the road from the Pantazes’ Poconos home. As we visited with family and friends, we had the chance to spend a lot of time sharing our church planting plans. We got some great feedback and words of encouragement. I hope to incorporate all their suggestions into my proposal and get it submitted in the next day or so. Thanks for reading!